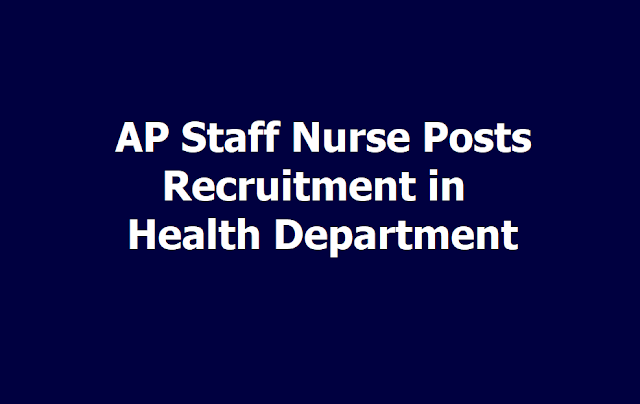 AP Staff Nurse Posts 2019 Recruitment in Dist.Govt General Hospitals: Govt of AP HM and FW Department Staff Nurse Posts 2019: AP Health Medical & Family Welfare Department has given the AP Staff Nurse Posts 2019 Recruitment, Submit Application form till March 5: AP Staff Nurse Posts recruitment 2019 notification and Applications are invited from the eligible candidates who are having DGNM / BSc. (N) / MSc. (N) qualification for filling up of 155 Staff Nurse posts under G.O. Rt. NO. 44, Health, Medical and Family Welfare (E1) Department, Dt:25.01.2016. Application and other details are available in District Official Website and can be downloaded. 155 మంది స్టాఫ్‌ నర్సుల నియామకానికి మార్చి 5వరకూ దరఖాస్తులు స్వీకరిస్తారు. ఈ పోస్టులకు కూడా దరఖాస్తులు వెల్లువెత్తుతున్నట్లు సమాచారం. వీరి నియామక ప్రక్రియను సైతం మార్చి నెలాఖారుకు పూర్తి చేయాలని ఆరోగ్యశాఖ ఆలోచిస్తోంది. Govt. of AP, HM & FW Department 155 Staff Nurse Posts and Last date is 05.03.2019: Government of Andhra Pradesh, Health, Medical and Family Welfare Department invites applications from the eligible female candidates for appointment to the post of Staff Nurses to be filled on regular basis. Applications are invited from eligible female candidates in the prescribed “Application Form” and should be submitted on or before 05-03-2019 BY 5.00 P.M.to the Regional Director Of Medical and Health Services, Visakhapatnam / Rajamahendravaram / Guntur on all working days for recruitment to the posts of Staff Nurses under the control of the Regional Director of Medical and Health Services concerned. The candidates belonging to Zone - IV, they should submit their applications in the Office of the Director of Public Health and Family Welfare, Himagna Towers, III Floor, LIC Colony, Gollapudi, Vijayawada on or before 05-03-2019 by 5.00PM. Qualification: Intermediate, General Nursing and Midwifery(GNM). Age: Candidates should not have completed 40 years as on 30.06.2019. Candidates shall pay Rs.500/- ( Rupees five hundred only)in Crossed demand draft along with the application in favour of Director Of Public Health and Family Welfare, , Payable at Vijayawada. However SC., ST., PH and BC candidates are exempted from payment office. b. 75% marks will be allocated against marks obtained in the qualifying examination i.e., Aggregate of marks obtained in all the years in the qualifying examination. d. Up to 10% marks @1 mark per each completed year after acquiring the requisite qualification. e. They should have minimum six months of continuous service as Contract Staff nurse are eligible for weight age. They should have put in satisfactory service. The candidate will not be given any weight age, if any adverse remarks are passed. a. @2.5 marks per six months in Tribal Area. b. @ 2.0 Marks per six months in Rural Area. c. @1.0 mark per six months in Urban Area. 1. Diploma in General Nursing & Midwifery (or) B.Sc Nursing Degree (or) M.Sc Nursing Degree. 8. In the absence of the above certificate the candidate will considered as Non local. any) Issued by Tahasildar concerned. 10. In the absence of proper certificates the candidate will be considered as OC only. 11. Copy of the latest Physical Handicapped certificate issued by the Medical Board. (Southern) if applicable. “To the Chairman, Hospital Development Society” concerned Government General Hospitals. 14. The application submitted without the required certificate and incomplete applications will be rejected summarily. The Superintendents concerned hospitals are requested to give appointment orders to the individuals who are selected as per merit by the selection committee. The Superintendents of the concerned Hospitals are requested to approach the Collector & District Magistrate and cooperate with the Collector and recruit the Staff Nurses on contract basis as per the guidelines issued. Whether these post will convert from Contact to Permanent, if yes please let us know the expected period/date.